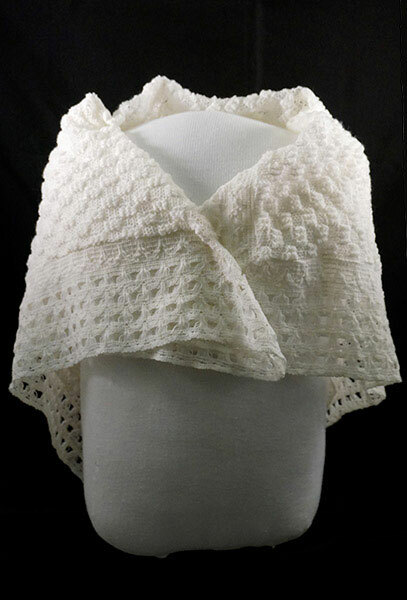 Luisa Moreno's shawl. Gift of Vicki L. Ruiz. A temporary display, Luisa Moreno, in the permanent American Enterprise exhibition examines the lasting legacy of Moreno, the Guatemala-born labor organizer, who brought together more than 100 groups in 1938 for El Congreso de Pueblos de Habla Española, the Spanish-Speaking People’s Congress. The display features objects representing Moreno’s work as a civil rights activist and labor organizer with union pins as well as her shawl and a pamphlet to rally national attention and halt Moreno’s deportation.